This past month has been slow in the incoming mail department which is pretty sad for someone who loves getting mail. Still, it's always a great mail day when there is something other than bills and ads in the post for me. Yesterday I got this lovely stack of mail. Swop-bot keeps me busy with little projects from time to time. As I mentioned in my last post I made a stationery kit for my partner. I received the kit my partner made for me this week and I love it! It was very thoughtfully put together and I have already begun using the contents. My favourite thing in the kit was the personalized swap cards she made for me. Swaps also feed my stamp collection. I've been collecting stamps since I was about 7. My father is a big collector and that is how I got started. I also inherited my late mother-in-law's collection which consisted of about 7 cartons. It took quite a long time to sort. Mostly it was used stamps she had amassed. It seemed like everyone she ever met was saving stamps for her so the process of sorting things by country and then soaking them off the paper and putting them in albums took a very long time. I've still got things to go through, but the bulk of the collection is now organized. Midway through my sorting, my son took an interest in collection and that makes me happy. He'll take on the collection next. I got this fabulous swap from Stacy in the United States. 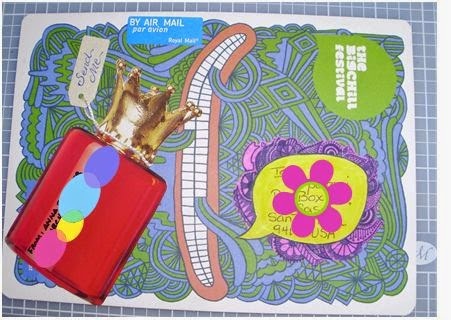 I think her mail art is great, especially since she incorporated some of my hobbies and favourite colours in her work. I keep the envelope on my desk for inspiration. I'm still a relative newby to mail art. My envelopes are not as developed as Stacy's but I'm working on it. 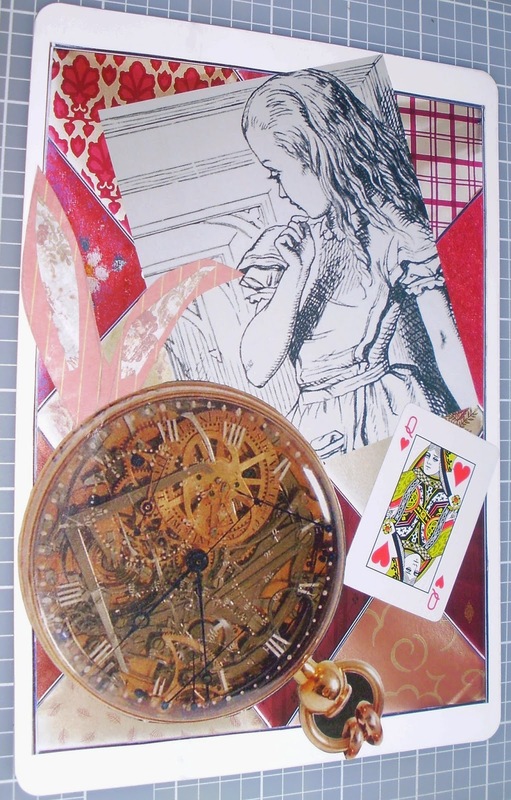 Collage is my number one mail art form as you can see here from this Alice in Wonderland themed postcard I did a while ago. Today while I was writing this I got three more stamp swaps and my partners added so many nice extras I thought I would show you those as well.